In her groundbreaking book, The Shock Doctrine, Naomi Klein coined the term “disaster capitalism” for the rapid-fire corporate re-engineering of societies still reeling from shock. The master of disaster? Privatization and free market guru Milton Friedman. Friedman advised governments in economic crisis to follow strict austerity measures, combining radical cuts in social services with the full-scale privatization of their more lucrative assets. Many countries in Latin America auctioned off everything standing — from energy and water utilities to Social Security — to for profit multinational firms, crushing unions and other dissenters along the way. As the prime movers of this deregulatory agenda, the GOP spin machine has launched into hyper-drive in an attempt to wash the blood from their hands. Governors across the nation, backed by Wall Street’s Club for Growth and the Koch Brother’s Americans for Prosperity, are working hard to convince average Americans the a jobs crisis is actually a deficit crisis and that the culprits are not the big banks on Wall Street, but state, county and municipal workers. ALEC is not a lobby, and it is not a front group. It is much more powerful than that. Behind closed doors, corporations hand legislators the law changes they desire that directly benefit their bottom line. Corporations are “equal” members. They have their own corporate governing board which meets jointly with the legislative board. Corporations and trade groups fund almost all of ALEC’s operations directly through hefty membership dues and indirectly through corporate foundations, like the Charles G. Koch Foundation. Corporations, like Koch Industries, Phillip Morris, Reynolds, Kraft, Wal-Mart, Bayer, Coca Cola, State Farm and more, sit on ALEC task forces and vote with state legislators to approve “model” bills in secret. They wine and dine legislators at swank hotels, with child care provided, fundraisers and other perks pre-arranged. After a swell time, participating legislators — overwhelmingly conservative Republicans — bring the bills home and introduce them into statehouses across the land as their own brilliant ideas and important public policy innovations. 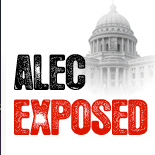 ALEC cuts out the middleman and the state legislators themselves become “super lobbyists” for the ALEC agenda. In 2010, Republicans won the governorship and control of both houses in 21 states. ALEC shock troops swung into high gear. In Wisconsin, Ohio, Michigan, Indiana and Maine a steady stream of bills emerged from Milton Friedman’s shop. Starving State Government of Revenue to Make It Dysfunctional and Despised: ALEC members are introducing hundreds of bills to grant tax breaks to big corporations and to cripple state’s ability to raise revenue, including new constitutional rules to limiting state taxing powers. Grover Norquist would love these lethal proposals. Race to the Bottom in Wages for Americans: ALEC bills would repeal state or local laws that boost workers wages such as “living wage” and prevailing wage laws. ALEC bills call a starting minimum wage an “unfunded mandate” but think that prison labor is just terrific. ALEC also supports a radical “free trade” agenda that sends U.S. manufacturing and an increasing number of service-sector jobs overseas. Defunding Traditional Supporters of the Democratic Party: ALEC purports to be nonpartisan, but only 1 of 104 legislators in ALEC’s leadership is a Democrat. ALECexposed.org contains dozens of bills to defund public sector and private sector unions and to make it harder for trial lawyers to bring cases when consumers are injured or killed by dangerous products.